One of the many reasons I'm called "quirky"
I'm sure there are more, these are just a few that have come to me the last couple of days. 1. Burgers must be centered. If the patty, lettuce & tomatoe are even slightly off center, the whole thing must be taken apart and re-assembled evenly. 2. Hot dogs must be eaten from both ends. 3. The last bite of a sandwich must not have crust. 4. A spoon must remain in the cup of coffee, hot chocolate or tea for continual stirring as drinking. 5. Crumbs must be eaten first from a bag of potato chips and the whole ones left for last. 6. All meat must be cut into bite size pieces. 7. Food must be eaten simultaneously. No eating the rice first then the chicken. It must be mixed. 8. If there are two bites of steak leftover, just enough mashed potatoes must be added to the plate to finish the meal. 9. Pop is better flat. 10. No meal is complete without dessert. Good rules but don't agree with them all...lol. 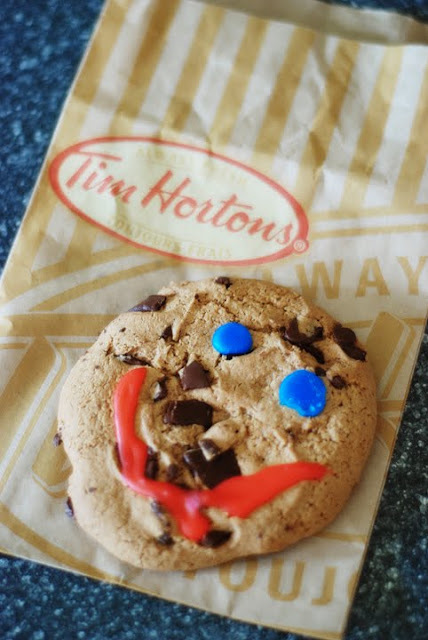 Definitely agree with the Smile Cookie though. YUM!!! Ha, Ha, Ha..funny..and cute but yeh...sorry, these rules don't apply in this household but in saying that - you are still welcome to visit anytime! I'm TOTALLY with you on #9 (pop being flat). I actually take my bottle and SHAKE, SHAKE, SHAKE it and do this repeatedly until my pop is flat!! People often tell me, 'that's gross'! So glad to hear I'm not the only one!